Is there a place for this species in a gallery of pictures devoted to wild birds? 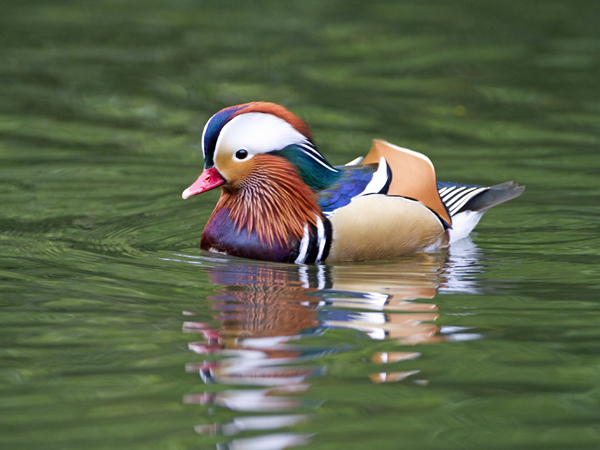 Some would say that because the Mandarin Duck is an ornamental waterfowl usually seen in collections kept by aviculturalists and has become so extremely threatened in its native Asian habitat, that the small numbers remaining in the wild mean that it has little or no chance of reaching Ireland by natural means. For these reasons, they would suggest that it has no place here. However I would contend that things are not quite so cut and dried as this. Over the years birds have escaped from wildfowl collections and have built up viable populations in parts of Britain and Ireland. 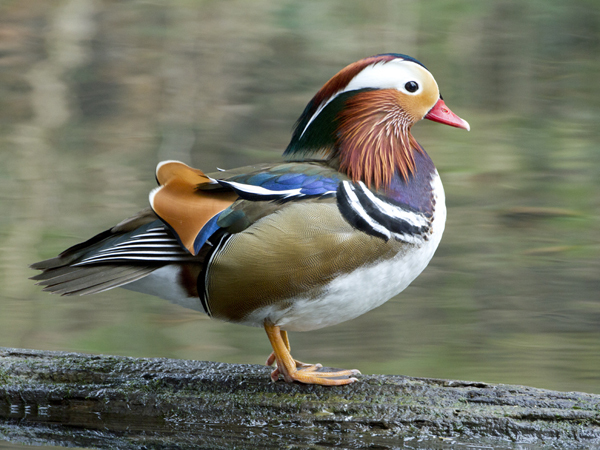 The British Ornithologists' Union Records Committee lists Mandarin Duck as a British Bird in Category C1 (species that, although originally introduced by man, either deliberately or accidentally, have established breeding populations derived from introduced stock, that maintain themselves without necessary recourse to further introduction). Category C along with Categories A and B constitute the Official British List. A similar situation exists in the Irish List and the Northern Ireland List. There are other instances of the species' acceptance: its inclusion in the recently published work by D.T. Parkin and A.G.Knox, The Status of Birds in Britain & Ireland, being one of the more important. Birders here should also bear in mind that other species which became established from captive stock are now totally accepted as British and Irish Birds. The Canada Goose for example. 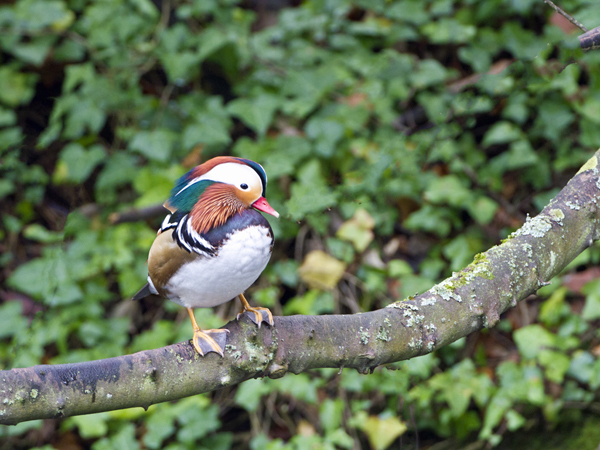 Mandarin Ducks prefer wooded habitats alongside rivers and lakes and the nest site is usually in a tree hole. They are quite at home perching on branches and they share these habits with their close relative from North America, the Wood Duck (Aix sponsa). These two are the only species in the genus Aix. Both are highly prized by aviculturalists but whereas this has contributed to the downfall of the Mandarin Duck, I am pleased to say that the Wood Duck has fared much better. 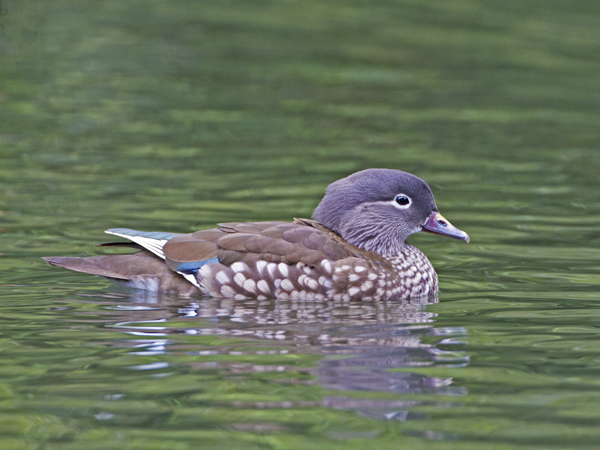 Its numbers too were at a low ebb earlier in the last century due to over hunting but following the introduction of very strict protection legislation it has become one of the commonest ducks in eastern USA. Here in Northern Ireland we have a small but seemingly self sustaining population of Mandarin Ducks which is to be found along the Shimna River in County Down. This population is actually cited by Parkin and Knox. These beautiful birds are sometimes to be found further down the river and even in the old boating pond in Newcastle. Regardless of whether you wish to count Mandarin Duck on your Irish List, the drake is surely one of the most beautiful birds you are likely to see in a day's birding. Female Mandarins are much duller in their plumage but nevertheless have a charm all of their own. The Chinese regard the Mandarin pair as a symbol of abiding love and have long illustrated them on pottery and scrolls. The present images were obtained last January in Phoenix Park, Dublin, where there are numbers of full-winged birds like those shown here. I hope you experience as much pleasure from these images as I did during the photography.